This tiered dish is very sentimental to me. My mom bought this in a shop at Disneyland when I was very little. I've always loved it. Last year for Christmas she passed it down to me. 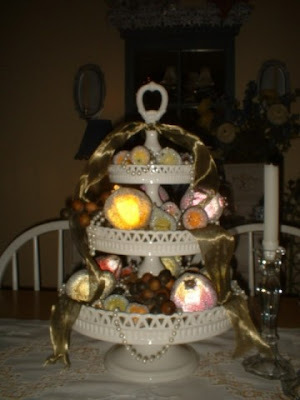 I've had fun decorating it for every season, moss with Easter eggs in the spring, faux lemons in the summer, chocolates for Valentines Day and this year for Christmas I put faux sugared fruit in it with pearl garland and some ribbon. Thank mom, I will cherish this piece forever. 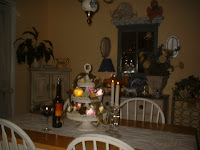 Such a beautiful, elegant centerpiece with such nice memories attached. It's beautiful. I love having things around me that have sentimental value, like you.